A deficiency of magnesium and potassium lead to arrhythmia, high blood pressure and malfunction of the heart muscle. Therefore, for the prevention and treatment of cardiovascular diseases prescribe "Panangin" - a drug containing in the structure a much-needed minerals for the body. Drink Panangin with laboratory-confirmed deficiency of potassium and/or magnesium, and also to prevent lack of, which can be provoked by diuretics. In the complex treatment take Panangin for the treatment of cardiovascular diseases. For prophylactic purposes take Panangin 1 tablet three times a day. Typically, the duration of reception determines the physician and is not less than 3 months. There is another prophylactic regimen of Panangin. If a drug is assigned to you as a vitamin product in the off season (fall or spring), drink it twice a day 2 tablets. The treatment in this case is a month. After suffering a cold, intense physical activity, when taking drugs for weight loss or to comply with rigid diet, drink 2 tablets of Panangin three times a day for two weeks. In cardiovascular pathology drink 3 tablets of Panangin three times a day. However, remember that this dose is the maximum and cannot be exceeded under any circumstances. Panangin drink immediately after eating, squeezed enough liquid (water, juice, tea, juice, etc.). When adverse symptoms such as nausea, diarrhea, epigastric pain, sharp decline in blood pressure, and allergic reactions (itching, hyperemia of skin, urticaria, etc. ), discontinue use of Panangin and consult your doctor. In severe cardiovascular diseases and in severe deficiencies of magnesium and potassium, consult your doctor for replacement of tablets, intravenous injection of Panangin. In this case, the treatment is usually performed in a hospital. Panangin medication prescribed for heart disease, headaches, diskah, disorders of the kidneys, heart, irritability, fatigue, and even deterioration of the General condition. With a deficiency or overabundance in the body of potassium and magnesium in humans can cause serious disorders of the cardiovascular system, brain, kidneys. Also frequent arrhythmias, fatigue, swelling of legs, face. With all these ailments helps this drug like Panangin, which is a real vitamin for the heart. Each tablet contains 140 mg of magnesium Asparaginate, 158 mg potassium Asparaginate. Auxiliary means are silicon dioxide colloidal anhydrous, magnesium stearate, talc, corn starch, povidone, starch, titanium dioxide, Eudragit E 100%, macrogol 6000. Panangin helps to normalize the level of potassium and magnesium in the cells of the tissues. Potassium and magnesium ions have an effect on the contractile action of cardiac muscle and thereby reduce the risk of oxygen starvation (hypoxia). The result prevented the development of cardiac arrhythmia, as well as improves the function of the gastrointestinal tract, and contraction of skeletal muscle. Drug Panangin assigned as adjuvant therapy in heart failure, cardiac arrhythmia caused by hypokalemia, which is possible with the intoxication cardiac glycosides such as digoxin, digitoxin, gitoxin, laniazid, caldigit and regime, as well as when taking prednisone, hydrocortisone and some diuretics. It is recommended the use of Panangin after infarction conditions, for abnormal heart rhythm commonly associated with ventricular arrhythmias. 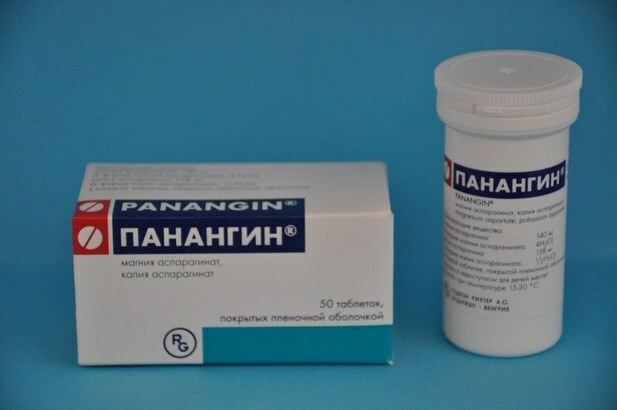 Panangin useful in the treatment and prevention of coronary heart disease, myocardial infarction, cardiac arrhythmias in the complex treatment of the glucosides with simultaneous use of urinary remedies, disorders of metabolism. Prescribed drug after severe infectious diseases, accompanied by large losses of fluid. Useful Panangin blood transfusion, when lack of food depleted in ions of magnesium and potassium. Panangin solution for injection can only be entered intravenously, intramuscular use injections can cause irritation to the tissue. Prescribe this drug and children. For example, in infancy, it is recommended to strengthen the heart muscle newborns, with open heart, to relieve seizures. Newborns sometimes after a heavy crying or at an elevated temperature, there may be convulsions. These symptoms usually occurs when deficiency of potassium and magnesium. And then, in this case there is a need in the purpose of Panangin, which is well tolerated by children. Panangin quite often given to pregnant women. With it during pregnancy can be combated with the swelling, toxicosis. The positive effect of Panangin has on the heart muscle and kidneys women. He also contributes to the proper development of the fetus, in particular, the formation of the brain and muscular apparatus. Panangin administered orally or intravenously. When it comes to tablets, adults of their appoint 1-2 pieces 2-3 times a day for 14 days. If necessary, the prescription dose can be increased to three tablets at one time to three times a day. Then gradually reduce the dose. For arrhythmia solution of Panangin are administered only intravenously, drip 1-2 ampoules, disposable. If necessary, the procedure can be repeated after 4-6 hours. When used correctly and compliance with the dose side effects of Panangin not revealed. In rare cases, patients with inflammation of the stomach, low acidity, cholecystitis may be a burning sensation, discomfort in the stomach. The reception panangina can experience a decrease in blood pressure, nausea, vomiting, diarrhea, reddening of skin, feeling of heat. When taking high doses may increased number of bowel movements. The use of Panangin contraindicated in cases of hypersensitivity to one or more components of the drug, acute or chronic renal failure, Addison disease, cardiogenic shock. It is not recommended to combine the drug with alcohol and drugs. And in some cases the use of Panangin on the background of pronounced intoxication can be dangerous. During the study of the drug revealed no negative impact on the ability to drive or operate complex, requiring special attention mechanisms. 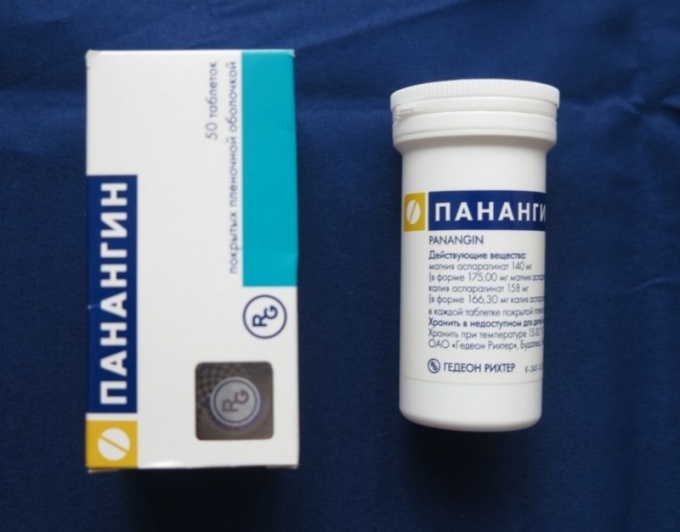 Panangin may cause to reduce the process vsasyvanija tetracycline, sodium fluoride, iron salts, so the reception panangina you must assign 3 hours later after taking the above drugs. With simultaneous use of Panangin increases the risk of potassium-sparing diuretics may cause arrhythmia and asystole. Panangin should be stored in a dry, dark place at a temperature of from 15 to 30 degrees. Shelf life tablets: 3 years ampoules with solution for injections in 2 years.